As our honored guest to the community of Christians at Door of Life, you will find a non-denominational church with contemporary praise & worship and Bible-based teaching. Our Sunday Service begins at 10am. Our cafe with snacks and coffee is open before and after service. The service usually runs approximately 1 hour 45 minutes in length. We have Nursery available for ages 0 to 5 and a Kid’s Church program for ages 6 to 12. Come as you are, casual fits right in! CDs of the message are available for free soon after each service. Our messages are also video streamed live online, with audio recordings of past messages available on our website as well as podcasts of the messages available at the iTunes store. There are Wednesday night meetings during the Fall, Winter and Spring months. These start at 7pm, with an Adult Bible Study and the Treasure Seekers program for kids ages 5 to 12. During the Summer months we usually have several worship nights. We also provide community support through our Food Pantry including an “Express” site located at our front entrance accessible at all times. 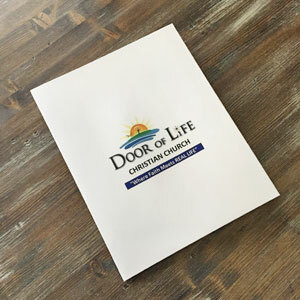 An Info Packet is available to anyone who in interested in learning more about Door Of Life Christian Church. This includes information about ministries that we offer, and how someone can get involved in the life of our church. Ask for a packet anytime! We’re glad to have you visit us in Sister Bay and online!